Switzerland is probably one of the countries that have kept the same coin design the longest. 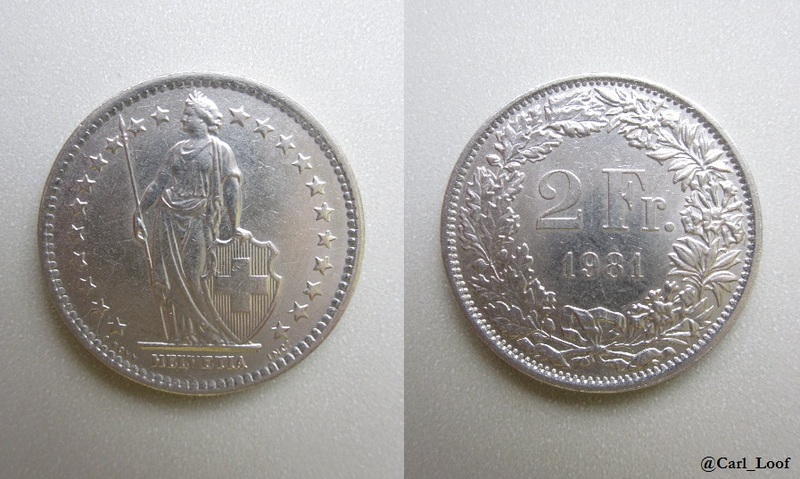 The ½, 1 and 2 franc coins have had the same design since 1875. In 1968 they switched from being in silver to copper-nickel. I like it when coin series is changed once in a while (I’m for instance totally bored with the current Swedish coins), but I can understand why they have kept the current design for all these years. It’s a traditional design with enough of things going on to keep you interested. The text HELVETIA might be cryptic, but it’s just the Latin name of Switzerland. The woman, who looks like a goddess, is Helvetia herself, the personification of the county – similar to Britannica, Marianne or Mother Svea. You can also spot the Swizz cross on her shield. This cross is featured on the country’s flag and it’s also the base of the Red Cross which was founded in Switzerland. Switzerland is generally considered to be a country of peace. “I’m neutral! I’m Switzerland!” is quite a common saying and rightly so. The Swizz managed to keep their neutrality even though they were completely surrounded by war during WWI and WWII. Switzerland hasn’t been in an armed conflict with another country since 1815 and that’s wonderful. But there is actually one country that surpasses that. The last time Sweden was at war with another country was in 1814 when the country tried to force Norway into a union (with a successful outcome). Since then Sweden has kept its neutrality, but this can of course be discussed. Many people clam the neutrality during WWII to just be a charade. And in these days Sweden has peace preserving troops in overseas territories (such as in Afghanistan). Can one really claim that Sweden hasn’t been to war since 1814? Whatever the case might be, Switzerland and Sweden is two countries that has a long history of peace and I think that this is something that has had a huge positive influence on the countries.